Vaccination with replication-competent vaccinia protects against heterologous orthopoxvirus challenge. CD4 T cells have essential roles helping functionally important Ab and CD8 antiviral responses, and contribute to the durability of vaccinia-specific memory. Little is known about the specificity, diversity, or dominance hierarchy of orthopoxvirus-specific CD4 T cell responses. We interrogated vaccinia-reactive CD4 in vitro T cell lines with vaccinia protein fragments expressed from an unbiased genomic library, and also with a panel of membrane proteins. CD4 T cells from three primary vaccinees reacted with 44 separate antigenic regions in 35 vaccinia proteins, recognizing 8 to 20 proteins per person. The integrated responses to the Ags that we defined accounted for 49 to 81% of the CD4 reactivity to whole vaccinia Ag. Individual dominant Ags drove up to 30% of the total response. The gene F11L-encoded protein was immunodominant in two of three subjects and is fragmented in a replication-incompetent vaccine candidate. The presence of protein in virions was strongly associated with CD4 antigenicity. These findings are consistent with models in which exogenous Ag drives CD4 immunodominance, and provides tools to investigate the relationship between Ab and CD4 T cell specificity for complex pathogens. Vaccinia viruses confer long-term protection from variola. Poxviruses are being used to deliver heterologous Ags in the settings of vaccines and immunotherapy. CD4 T cells likely are important in primary clearance of vaccinia and in the induction and maintenance of long-term memory and protection from variola challenge. We conducted proteome-wide screens of the CD4 response shortly after primary immunization. CD4 T cells help generate functionally important CD8 responses (1) through licensing of DC via CD40L (2). Helper functions include the priming of naive CD8 responses, the transition of primary CD8 cells into memory, the survival of CD8 memory cells, and the generation of secondary CD8 responses in specific models (3). CD4 help for CD8s is likely needed at one or more points for most viruses (4). This is especially true if viral immune evasions dampen innate signals that can mature DC, as does vaccinia (5, 6, 7). In vivo, CD4-depleted, CD4−/−, and MHC II−/− mice show delayed viral clearance and increased mortality after vaccinia infection (8, 9). Modified vaccinia Ankara (MVA)3 fails to protect MHC II−/− mice against vaccinia challenge (9). Vaccinia-specific CD8 T cells in MHC II−/− or CD4−/− mice have proliferative and functional protection defects (10, 11, 12) and cannot transition into memory cells (4). Ectromelia virus is an orthopoxvirus that infects mice in nature. Although primary CD8 responses to ectromelia virus are normal in CD4-depleted mice, helpless CD8 cells do not transition into memory or reactivate upon challenge. CD4-depleted mice fail to clear EV (13, 14). CD4 T cells assist Ag-specific Ab synthesis. Orthopoxvirus-specific Abs are necessary and sufficient for vaccine-induced protection from orthopoxvirus challenge (15, 16). CD4-deficient mice do not make specific Abs (8, 9). The cognate T-B help theory (17) predicts that targets of specific Abs should elicit CD4 responses. IFN-γ, TNF-α, and cytotoxicity are additional antiviral functions of human vaccinia-specific CD4 T cells (18, 19, 20, 21). Human data are consistent with important roles for CD4 T cells. The estimated half-life for CD4 responses to vaccinia is 8–15 years (18, 22, 23). Among donors in the decay phase of memory responses, persons with intact CD8 responses always had detectable CD4 responses (18, 24). Persons with HIV-related or idiopathic CD4 deficiency may fail to clear poxvirus infection (25). The specificity of CD4 responses to vaccinia is largely unknown. To probe the entire proteome in an unbiased fashion, we used a genomic DNA library based on a replication-competent vaccinia strain. We report that the CD4 response is very diverse, targeting up to 20 proteins per subject, and can be placed in a unique hierarchy for each person including immunodominant responses. The response emphasizes virion structural proteins and enzymes involved in viral replication. Detection of CD4 responses is highly correlated with the presence of the protein in purified virion preparations. These data are consistent with models of CD4 Ag presentation in which processing of extracellular Ags contributes to immunodominance. Adults (Table I⇓) receiving scarification with Dryvax smallpox vaccine for occupational health gave Institutional Review Board-approved consent. Subjects 3 and 9 (subjects 1–8 correspond to our previous report (26)) had been vaccinated 35 years before whereas subjects 2, 7, and 10 were primary vaccin. Blood for Ag discovery was drawn 4–6 wk after vaccination. PBMC were cryopreserved after Ficoll enrichment. HLA typing used DNA-based methods. PBMC were seeded at 106/ml in 2 ml of T cell medium (TCM) (27) in 24-well plates. Live or UV-inactivated vaccinia was added at multiplicity of infection (MOI) 10. IL-2 (Hemagen) was started on day 5 (32–50 U/ml). Cultures were split and fed periodically with IL-2-TCM. Proliferation or intracellular cytokine cytometry (ICC) assays, re-stimulation in bulk, or subcloning was done on days 12–14. Untouched CD4+ T cells were enriched from some cultures by negative selection (Miltenyi Biotech). Screening assays were performed (see below) and cultures with activity were expanded, after enrichment of CD4+ T cells in some cases, one cycle using anti-CD3 mAb, IL-2, and feeder cells (28). Resultant second generation bulk cultures were frozen in aliquots. For some subjects, cells in first-generation bulk cultures were cloned with phytohemagglutinin-P (Remel) and IL-2 (27). Cloning was done by limiting dilution, with cultures assigned as clonal coming from dilutions with <37% of cloning wells positive for growth by visual inspection, giving a >95% chance of clonality per the Poisson distribution (29). Clones were screened (day 14) by proliferation and IFN-γ assays (below). Positive clones were expanded with anti-CD3 and IL-2 (28). EBV-transformed B cells (LCL) were derived from PBMC (30). LCL GI10897 (DRB1 1401,1101;DRB3+) was prepared in-house. IHW 09123/HAYBD is HLA-DRB1 1407,1501;DRB3+;DRB5+. Vaccinia strain NYCBH was raised and titered in BSC-40 cells (26). BSC-40 used to grow vaccinia stocks (5.4 × 109 PFU/ml before inactivation) for functional assays were Mycoplasma negative (Cambrex). UV inactivation (27) eliminated detectable infectious virus. Triplicate PBMC proliferation assays used 1 × 105 responders in 200 μl of TCM in 96-well U-bottoms and 5-day [3H]thymidine proliferation (27). For cultured responders, 3 × 104–105 irradiated (3300 rad gamma irradiation), autologous or HLA-defined allogeneic PBMC were added per well in final 200-μl volumes as APC. Responders were one eighth to one quarter of available young candidate clones, or 1–2 × 104 bulk or cloned cells, per well. Candidate clones were screened singly or in duplicate. Bulk cultures and established clones were tested in duplicate or triplicate. In selected assays, LCL were used as APC. LCL were infected for 15 h with live vaccinia at MOI 10, irradiated (8000 rad), washed, and used at 5 × 103/well with 3 × 104/well cloned responder cells in triplicate. [3H]Thymidine was added on day 3 and cells harvested on day 4. Clones with screening stimulation indices (27) of >10 were expanded. Assignment of restricting HLA class II loci used mAb against framework determinants in HLA-DR, HLA-DP, or HLA-DQ at 1/10 dilutions of culture supernatants (27). At least 40% inhibition of proliferative or IFN-γ ICC readouts, and a consistent pattern in duplicate tests of each mAb, was required to assign restriction to an HLA locus. Assignment of restricting HLA alleles used allogeneic PBMC as APC that were partially allele-matched to the T cell donor. Results were analyzed for informative, nonambiguous HLA restriction patterns (27, 31). PBMC and T cell replication was also tested by CFSE dilution (32). Cells were stained with anti-CD4-PE (BD Biosciences) on day 3 and 5 × 104 cells in the lymphoblast forward/side scatter gate were analyzed. For PBMC, IFN-γ responses were measured using 3 × 106 PBMC incubated with UV-mock or UV-vaccinia (1/1000) in 1 ml of TCM with anti-CD28 and anti-CD49d (BD Biosciences) (33). Brefeldin A (Sigma-Aldrich) was added after 1 h. After 6 h, cells were stained with anti-CD4-PE-cyanin 5 or FITC, permeabilized, and stained with anti-IFN-γ-PE or isotype-PE control (BD Biosciences) (26). For cultured responders, 5 × 105-106 T cells and a similar number of irradiated PBMC (as APC) were similarly cultured in 0.5–1.0 ml of TCM. In some experiments, either APC or responders were stained with CFSE (32) before cocultivation. Negative controls were DMSO (0.1%), mock BSC-40 (1/1000), or heat-killed Escherichia coli transformed with empty vector pBAD/Myc-His/lacZ (Invitrogen Life Technologies) or inclusion bodies prepared from these bacteria (below). Positive controls were PMA/ionomycin (34), and whole UV-irradiated vaccinia (1/100–1/1000). Peptides were tested at 10 μg/ml. IFN-γ protein was measured in culture supernatants by ELISA (28) on day 5 for PBMC or day 3 for T cell lines and clones. Cytotoxicity was tested in duplicate or triplicate 4-h 51Cr-release assays with autologous mock- and vaccinia-infected (MOI 10, 18 h) LCL at 2 × 103/well as targets (30) and 20 effectors/target. Percentage of specific release was calculated (30). Binding of peptides to recombinant HLA molecules was performed as previously described (35). Bulk and cloned cultures were stained for TCRαβ, CD4, and CD8 as described (26). PE-labeled tetrameric complexes of HLA-DRβ4*0101, HLA-DRα1*0101, and vaccinia peptides were prepared as described (36). Bulk-cultured T cells or PBMC were stained with 1 μl of tetramer for 60 min at room temperature in 50 μl of TCM, followed by addition of anti-CD4-FITC (Caltag), washes, and fixation. ICC and tetramer data are reported as the percentage of CD4+ lymphocytes that stain positive. When CFSE was used in ICC protocols, we used CFSE fluorescence to exclude the CD4+ cells in the APC population and restricted analysis to the responder cells. Data collected on FACScan (BD Biosciences) were analyzed with WinMDI2.8 (http://facs.scripps.edu/software.html) or FlowJo 8 (Treestar). Blunt-ended, 200–500 bp vaccinia NYCBH DNA fragments were purified as described (26) and ligated to linkers (GAGGGTCCGACAGC) with 5′ GA overhang and blunt 3′ end. Unincorporated linkers were removed. pBAD/Myc-His/lacZ was XhoI-digested, filled in with dTTP and dCTP and gel-purified, yielding complementary overhangs. After ligation and DNA purification, libraries were created by electroporation (BTX) of E. coli DH10B (Invitrogen Life Technologies). Bacteria rinsed from ten primary 150-mm ampicillin plates were frozen in aliquots. The primary library contained ∼3 × 104 unique colonies. Inserts in random colonies were sequenced (primers on request) with BigDye 3.0 (ABI). Vaccinia open reading frames (ORFs) are named from strain Copenhagen or Western Reserve (WR) (37). 96-well deep-dish plates (n = 3) were seeded at 30 colonies/well for the working library. Overnight cultures were frozen in aliquots. To create β-galactosidase-vaccinia fusion protein pools, bacteria in 96-well ampicillin plates were induced with arabinose (Sigma-Aldrich) (0.2%) for 6 h after OD600 reached 0.4. In a matrix strategy, bacteria from each row and column were pooled (20 pools/plate of 240–360 bacterial variants/pool). β-Galactosidase-vaccinia fusion protein inclusions were enriched (31) and used at 1:100 in proliferation assays. In an alternative strategy, E. coli from each well (n = 288) were heat-killed (56°C, 60 min) and washed once with PBS-10 mM EDTA and twice with PBS. These were screened at 1:100–1:1000. The negative control was pBAD/Myc-His/lacZ, expressing β-galactosidase. For the inclusion body/matrix method, library “hits” were decoded using bacteria in wells at the intersections of positive row and column pools. For either pathway, bacteria from positive pool wells were plated on ampicillin plates. Bacterial colonies (96) were picked to microtiter plates, expanded, arabinose-induced, heat-killed, and washed. Proliferation assays used 105–106 bacteria/well. Bacterial colonies stimulating >1000 cpm [3H]thymidine proliferation in each of two duplicates, and with a stimulation index >2.5 compared with empty vector, were considered positive. For ICC, 5 ml of transformed E. coli were arabinose-induced. Inclusion bodies resuspended in 200 μl of PBS were tested at 1:1000. Bacterial colonies stimulating >0.1% of CD4+ cells above background were considered positive. Sequences of library hits typically allowed preliminary identification of antigenic regions (see Results). In some instances full-length vaccinia ORFs were cloned and expressed for confirmation. To reduce the size of some candidate regions, targeted truncations were made. Vaccinia NYCBH DNA was amplified with PCR primers containing HindIII and XhoI restriction sites (primers on request) using Pfu polymerase (Stratagene). PCR products were ligated into digested pBAD/Myc-His/lacZ and candidate clones validated by sequencing. E. coli transformed with truncations were induced to express fusion β-galactosidase-vaccinia fusions. UV-vaccinia stimulated maximal [3H]thymidine proliferation by PBMC from recent vaccinees at 1:1000 in preliminary assays and was used at this dilution. Vaccinia strain WR proteins L1R aa 1–185, A33R aa 58–185, B5R aa 20–275, and full-length A27L were expressed in baculovirus as polyhistidine fusions (38, 39). Proteins purified by metal chromatography were used at 2 μg/ml. Synthetic peptides (CPC or Mimotopes) were dissolved (10 mg/ml) in DMSO. PHA-P was used at 1.6 μg/ml and anti-CD3/CD28 beads (Invitrogen Life Technologies) at 10 beads/cell. The proportions of vaccinia ORFs that are CD4 Ags and that are structural virion components were compared in a 2 × 2 table using Fisher’s exact test, two-tailed (Instat 3.06; GraphPad). Vaccinia infection causes acquisition of virus-specific CD4 responses, assessed by both [3H]thymidine incorporation and CFSE dilution. The vaccinees also acquired CD4+ cells that synthesized IFN-γ upon Ag stimulation (Fig. 1⇓), with integrated frequencies of vaccinia-specific cells on the order of 1% at 2–4 wk after primary vaccination. We therefore enriched vaccinia-reactive cells before probing them with fragments of the vaccinia proteome. PBMC were cultured one cycle with live- or UV-treated vaccinia strain NYCBH. Either treatment led to medium acidification and increases in cell number over 10–14 days, with support from exogenous IL-2. The outgrowing cells were mostly TCRαβ+. The proportions of CD4 and CD8 single-positive cells varied between subjects (not shown). CD4 responses to human vaccinia NYCBH infection in PBMC. Top, Net proliferative responses to UV-vaccinia or anti-CD3/CD28 beads before and after vaccination. Data are mean ± SD of 8 reported (26 ) subjects. Middle, CFSE dilution after PBMC stimulation with UV-vaccinia, before and after primary vaccination. Bottom, IFN-γ accumulation by PBMC before and after primary vaccination. Data are the proportion of CD4+ lymphocytes that are IFN-γ+. We used CD4 T cell clones for initial rounds of expression cloning-based Ag discovery. 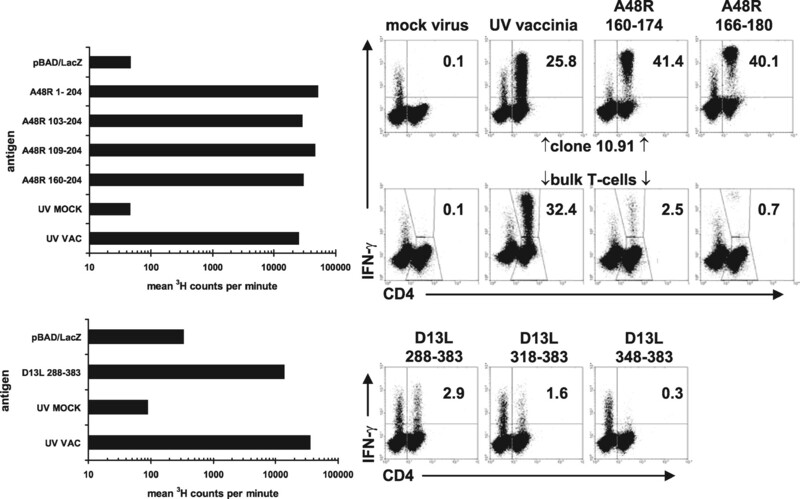 Vaccinia-specific CD4+ clones could be derived from bulk cell lines made by live or UV-vaccinia re-stimulation of PBMC, with or without CD4 selection before cloning (Figs. 2⇓ and 3⇓). Of note, some CD4+, TCR αβ+ clones proliferated, but did not make IFN-γ in response to vaccinia Ag (Fig. 2⇓). Clones 10.80 and 10.91 from subject 10 (Table I⇑) were chosen for antigenic specificity analyses. Both were restricted by HLA-DR, and proliferated in response to vaccinia plus allogeneic APC that were matched to subject 10 at HLA-DRB1*0405 (Fig. 2⇓). Vaccinia-specific clones typically displayed selective cytotoxicity toward autologous, vaccinia-infected LCL, but not toward uninfected LCL. Alloreactivity toward partially HLA-DR-matched LCL was noted for a clone from subject 7 (Fig. 3⇓). This clone was DR-restricted based on mAb inhibition (not shown). Subject 09123 was matched with subject 7 at DRB1*1407, whereas subject 10897 expressed DRB1*1401, a near match for DRB1*1407. Neither expressed DRB1*1403, a rare allele which is divergent from *1401 and *1407 at the amino acid level (40). Neither allogeneic cell line consistently presented vaccinia. Proliferation and CTL assays showed clear-cut reactivity with the allogeneic cell line 09123 in the absence of vaccinia. Vaccinia-specific CD4 clones. 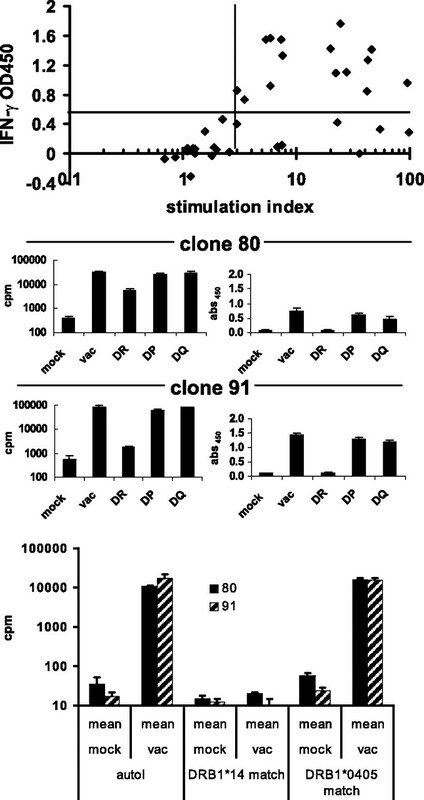 Top, Representative clones (n = 36) from subject 3 made by nonspecific cloning of PBMC stimulated one cycle with live vaccinia. Data are stimulation indices (27 ) and raw OD450 IFN-γ ELISA values. Middle, HLA restriction of clones from subject 10 used for determination of fine specificity. Autologous PBMC were used as APC with anti-HLA class II mAbs. Readouts are (top) mean of triplicate net [3H]thymidine incorporation, and mean of triplicate IFN-γ in 72 h supernatants (OD450). Bottom, HLA restriction of clones 10.80 and 10.91 using autologous or partially HLA-DR-matched PBMC as APC. Alloreactivity of CD4+ clone 39 from subject 7. Left, Cytotoxicity toward infected or uninfected LCL at an E:T ratio of 20 in triplicate 51Cr release. Right, Proliferative responses to infected, irradiated, washed LCL. Data are mean ± SD [3H]thymidine incorporation. To determine fine specificity, we adapted the inducible prokaryotic protein expression strategy from previous work on HSV-2 (31, 41). Vaccinia virus and HSV-2 both have large DNA genomes (42). Vaccinia-fragment fusion proteins were expressed that form insoluble inclusions. These remain antigenic within killed bacteria, or after enrichment by lysis, when PBMC are used as APC (31). Overall, 3 × 104 independent colonies were obtained in the primary library. Library quality was checked by sequencing insert DNA in 36 random clones. Single vaccinia inserts, 305 ± 206 bp long (mean ± SD), were present in 72% of clones. The remaining clones were empty (14%), or contained a primate DNA sequence, likely from BSC-40 cells (11.1%). One clone (0.3%) contained a Mycoplasma insert followed by a vaccinia fragment ligated end-to-end. The primary library screen used 288 library pools with a complexity of 30 independent transformed E. coli clones per pool. Considering library purity, fragment length, and the vaccinia genome size (191,738 bp for strain Copenhagen; see Ref. 37), the genome was over-sampled 9.9 times. To determine the specificity of CD4+ clones, a combinatorial library screen of row/column matrices of pooled inclusion body preparations was performed. Single bacteria from pools at the intersections of positive rows/columns were assayed as arabinose-induced, heat-killed E. coli. Single active bacterial clones were identified and their DNA was sequenced. For T cell clone 10.80, sequencing revealed a single insert predicted to encode aa 103–192 of ORF A48R. However, the fusion polypeptide was predicted to be out of frame with predicted vaccinia Copenhagen ORF. The first predicted methionine codon in the insert was aa 160. We compared full-length A48R, the original library hit (103-M160-192), and PCR-generated truncations. Proliferative responses confirmed reactivity with ORF A48R and mapped an epitope to aa 160–192 (Fig. 4⇓, top). A48R peptides 160–174 and 166–180 were strongly positive by IFN-γ ICC assay, assigning the epitope to aa 166–174, IHWQIISSE (Fig. 4⇓, top). Other peptides in the 160–192 region were negative (not shown). Bulk vaccinia-specific T cells from subject 10 also showed CD4 reactivity to both peptides. For T cell clone 10.91, the positive library hit contained, in-frame with β-galactosidase, DNA predicted to encode aa 288–383 of vaccinia ORF D13L. Truncation analysis using heat-killed E. coli as Ag mapped the epitope to aa acids 318–348 (Fig. 4⇓, bottom). Fine specificity of vaccinia-specific CD4+ clones 10.80 and 10.91. Top, Clone 10.80. Left are mean of duplicate proliferative responses to killed E. coli expressing the indicated vaccinia protein fragment fusions to β-galactosidase, or UV-mock or UV-whole vaccinia controls. Right are reactivity of clone 10.80 (upper) or bulk vaccinia-reactive T cells (middle) to controls or vaccinia peptides (10 μM) using IFN-γ ICC readout. Bottom, Clone 10.91. At left is proliferation as for clone 10.80. At right is IFN-γ reactivity to E. coli expressing defined fragments of ORF D13L. Numbers are percentage of CD4+ cells expressing IFN-γ. We previously adapted CD8 expression cloning from virus-specific CD8 T cell clones to polyclonal T cell responders (26, 28), saving resources and time. One cycle of vaccinia stimulation enriches CD4+ IFN-γ responses to whole virus Ag by 20- to 30-fold (Figs. 1⇑ and 4⇑), yielding polyclonal lines that are sufficiently reactive for Ag discovery. In this format, we use easily prepared heat-killed E. coli from library pool wells (complexity, 30/well) rather than inclusion bodies. Every positive well (stimulation index >4 compared with empty vector) was submitted for reduction to positive single bacterial colonies. Sequencing the inserts revealed a plethora of diverse vaccinia DNA fragments. The “hits” were assembled into overlapping regions and subjected to further analyses to derive candidate antigenic regions, as summarized in Table II⇓. Examples of deductive processes are outlined below for subject 2. Overall, we detected 22 unique antigenic regions for subject 2, 12 for subject 7, and 23 for subject 10 using this strategy. Some regions were antigenic for more than one subject (Table II⇑), for a total of 43 unique antigenic zones in 34 separate ORFs uncovered with the library strategy. Assignment of the probable antigenic ORF and region from the sequence(s) of library hit(s) was straightforward in some cases, but less so in others (Fig. 5⇓). 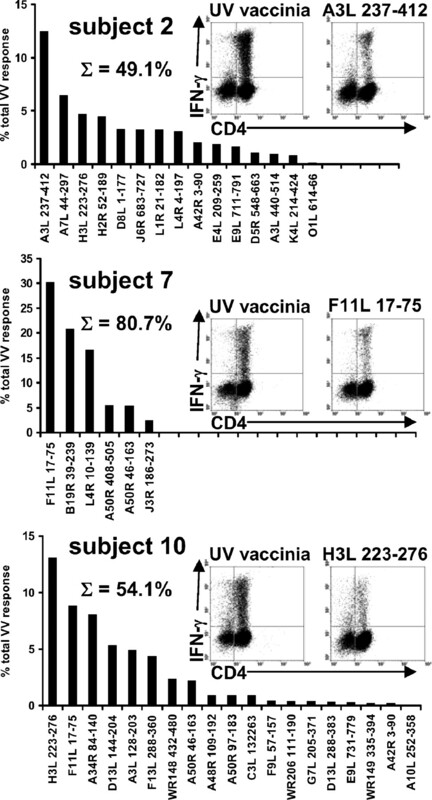 For vaccinia ORF E4L, bulk T cells reacted with independent library fragments containing aa 111–244, aa 173–237, and aa 209–259, respectively, each expressed as in-frame fusions with β-galactosidase. The shortest overlapping region was aa 209–237. Peptide 215–229 (NKEITEILPDNNPSP) was positive (Fig. 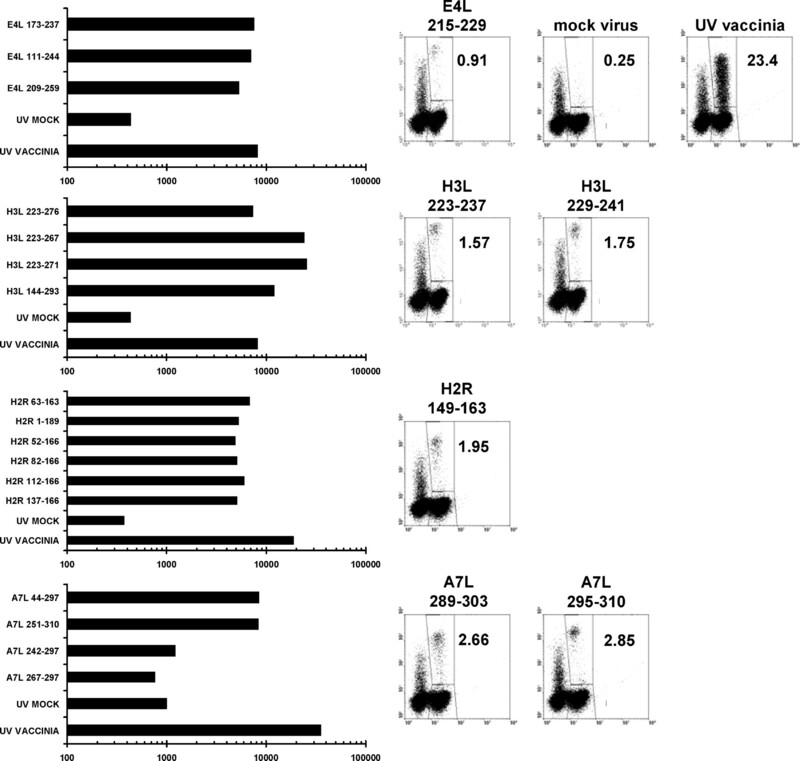 5⇓, top row), with 0.91% of CD4 T cells accumulating IFN-γ compared with 23.4% for whole UV vaccinia Ag, whereas overlapping/adjoining peptides from this region were negative (<0.1%, not shown). For vaccinia ORF H3L, 5 unique library hits were each expressed as out-of-frame fusion fragments with β-galactosidase. Four shared a common internal methionine codon at residue 223 (197–276, 209–267, 199–271, and 184–263), while in the fifth (123–293) the first internal methionine was at residue144. The predicted in-frame overlap, assuming initiation at an internal methionine, is aa 223–267. Peptides 223–237 and 229–241 both stimulated IFN-γ responses, localizing an epitope to aa 229–237 (ILDNAAKYV) of H3L (Fig. 5⇓, second row). Examples of the deduction of the specificity of vaccinia-reactive CD4 T cells from subject 2. See text for details. Each shows, at left, mean of duplicate proliferative responses of bulk T cells to E. coli expressing the indicated vaccinia protein fragments fused to β-galactosidase. Background response to E. coli transformed with empty pBAD/Myc-His/lacZ was <1000 cpm. At right, bulk responders were stimulated with peptides and stained for IFN-γ and CD4. APC were de-gated using CFSE (see text). Data are percentage of CD4+ responder cells expressing IFN-γ. Other peptides tested, stimulated less than 0.4% of CD4+ cells. For E4L, all library hits (left) were in-frame fusions with β-galactosidase. For H3L, each library hit was an out-of-frame fusion and the indicated starting amino acid numbers are the first internal methionine residues. For H2R (third from top), the library hit is the upper bar (aa 63–163). Full-length H2R is below, followed by the indicated truncation constructs. For A7L, two library hits are shown at top. Constructs expressing overlapping regions were negative (third and fourth bars). Peptides in the C-terminal nonoverlap region were positive (right, see text). Some predicted antigenic regions were long and were therefore truncated before peptide synthesis. For example, a library hit encoded aa 44–163 of vaccinia ORF H2R as an out-of-frame fusion with β-galactosidase, with a first internal methionine codon at aa 63. Truncations narrowed the original candidate region, 63–163, to aa 137–163. Peptide 149–163 (QYLIKHKSNNVITCG) was positive in IFN-γ ICC (Fig. 5⇑, third row); neighboring peptides were negative (not shown). One complexity is illustrated for ORF A7L. Fragments encoding aa 44–297 (as an in-frame fusion with β-galactosidase) and aa 243–310 (out of frame, internal methionine at aa 251) led us to detailed study of the predicted overlap region of aa 251–297. However, PCR-generated fragments of this region were negative (Fig. 5⇑, bottom). We then made peptides covering aa 289–310, within the library hit 44–297 but extending C terminus to the 251–310 overlap. Peptides 289–303 and 295–310 were positive, locating an epitope to aa 295–303 (ETSFIFIET). Likely, there is a separate epitope within aa 44–251, which is currently under investigation. The epitope region assignments based on shortest overlapping region analyses without peptide confirmation should be considered provisional, but antigenic ORFs are still considered to be accurately assigned by our data. Similar pathways defined two more peptide epitopes. The polyclonal line from subject 2 detected a library hit encoding aa 237–412 of ORF A3L. Truncation analysis narrowed an antigenic region to aa 296–355. Peptide 314–328 (MNIRMGIFYCNDDDA) was positive in IFN-γ ICC with subject 2 responders. Also for subject 2, overlapping in-frame hits encoding aa 227–298 and 232–282 of ORF C10L were reactive. Peptide 258–272 (DDNRNIAWDTDKLDD) stimulated IFN-γ accumulation. This response was HLA-DQ restricted at the level of proliferative responses to the longer fusion constructs expressed in E. coli. The subject was homozygous for HLA-DQB1*0202 and the peptide has elements of the DQ2 motif (40). The human CD4 T cell Ags deduced from high-throughput screening (Table II⇑) are listed with an abbreviated reference to the logic and methods used to assign reactivity. Overlapping regions present in library hits, as for ORFs E4L, H3L, and A7L in the examples discussed above (Fig. 5⇑), were considered most likely to contain an epitope or epitopes, despite the A7L counterexample (above). When methods were used sequentially (for example, fragment overlap alignment followed by truncation analysis followed by synthetic epitopes), the last-used technique, yielding the smallest predicted or measured antigenic fragment, is listed (Table II⇑). Expression cloning and follow-up strategies, used singly or in combination, along with other deductive methods, allowed us to make a total of 43 CD4 separate Ag assignments in 34 unique vaccinia ORFs. We found at least three CD4 epitopes in vaccinia ORFs A3L, A50R, and D13L, and at least two CD4 epitope in ORFs WR148, WR149 and likely A7L (above). The within-subject diversity of the CD4 response was considerable. We found 22 antigenic regions in 19 ORFs for subject 2, 19 antigenic regions in 17 ORFs for subject 10, and 9 antigenic regions in 8 ORFs for subject 7. Six antigenic regions, in ORFs A3L, A42R, A48R, F11L, H3L, and WR206, were recognized by two of the three subjects. Peptide epitopes were defined in the A3L and H3L antigenic regions, and each was recognized by both of the relevant subjects. Two subjects each recognized an additional epitope in L1R (below). The CD8 response to vaccinia (43, 44) and other large genome viruses (45, 46) show high degrees of immunodominance in mice, with single responses to single epitopes accounting for a large proportion of total responses. Less is known about humans or about immunodominance in CD4 responses. To investigate this topic, we isolated inclusion bodies from E. coli clones containing the vaccinia ORF fragments identified (above) as antigenic. Polyclonal T cells responder cells from three primary vaccinees were each probed with the set of vaccinia ORF fragments matched to that subject by expression cloning. The total response was defined with whole UV vaccinia, used at a high concentration (1:100, corresponding to 36 PFU/cell before inactivation) that gives maximal responses (not shown). Single cell reactivity was enumerated with IFN-γ ICC. CFSE labeling excluded the autologous PBMC used as APC from analysis. Each subject shows a clear hierarchy of CD4 reactivity (Fig. 6⇓). For subjects 2 and 10, the largest single response accounted for ∼13% of the total. Summing the 14 to 19 detectable IFN-γ responses in these subjects, we could account for 49–54% of the overall reactivity. Subject 7 had fewer Ags eliciting IFN-γ reactivity. A single fragment of ORF F11L accounted for 30% of the whole virus response, and overall we could reconstruct 81% of the total response. ORFs F11L and H3L were among the top three Ags for two subjects, and other ORFs including A3L and L4R were also potent in this assay. Some vaccinia fragments that were positive in our proliferation readout-based library screen did not stimulate IFN-γ responses above baseline. This was especially notable for subject 7, who had 9 antigenic fragments positive for proliferation (Table II⇑), but only six by IFN-γ ICC (Fig. 6⇓). Hierarchy of CD4 responses to vaccinia antigenic fragments among bulk vaccinia-reactive T cells. The readout throughout was IFN-γ accumulation among gated CD4+ responder cells. The total response was evaluated by stimulating bulk T cell with UV-killed vaccinia at 1:100 and subtracting the value for UV mock Ag (<1.0% for each subject). The response for each indicated library fragment was obtained by stimulating bulk T cells with an inclusion body preparation (1:1000) and subtracting the value for inclusion bodies of β-galactosidase derived from E. coli transformed with empty vector (<0.5% for each subject). Responses were normalized by considering the whole vaccinia response to be 100%. Insets show responses to whole vaccinia and most stimulatory fragment for each subject. Data are percentage of CD4+ responders that are IFN-γ+. Protection from heterologous orthopoxvirus challenge is dependent upon Abs (15). Several potent vaccinia neutralizing membrane Ags have been described (38, 39, 47, 48, 49). We expressed and purified three proteins (L1R, A33R, B5R) as extracellular domains and one (A27L) as a full-length construct. Using the polyclonal vaccinia-reactive T cell lines discussed above, we detected CD4 T cell reactivity to ORF L1R in subjects 2 (Fig. 7⇓) and 9 (not shown), and to A33R in subject 2 (Fig. 7⇓). Reactivity to L1R, but not A33R was independently detected in the library screen (Table II⇑). The A33R data bring our aggregate CD4 Ag discovery to 44 antigenic regions in 35 vaccinia ORFs. We were able to define peptide epitopes in A33R (aa 160–173, TKTTSDYQDSDVSQ) and L1R (aa 127–137, KIQNVIIDECY) after obtaining preliminary positives with overlapping 20-mers (not shown). The A33R response was HLA-DQ restricted, whereas the L1R response was HLA-DR restricted. The L1R 127–137 peptide sequence (KIQNVIIDECY) did not have characteristics of the index subject’s DRB1 allele (*0701) (40). We made fluorescent tetrameric complexes of HLA-DRB4*0101 (with DRA1*0101) and the peptide. Specific staining of 0.92% of CD4+ lymphocytes in the polyclonal vaccinia-specific was noted (Fig. 7⇓), similar to IFN-γ ICC (Fig. 7⇓). L1R 127–137 also bound with high affinity (162 nM) to recombinant DRB4*0101 in a competition assay (35). Subjects 2 and 9 each had a functional DRB4 gene, reacted with peptide 127–137, and did not share DRB1 alleles or supertypes. Taken together these data suggest restriction by DRB4*0101. CD4 responses of bulk T cell line from primary vaccine subject 2 to purified vaccinia proteins expressed in baculovirus. Top row, Positive responses to purified protein A33R and L1R, representative negative response to A27, and control UV mock and UV whole vaccinia. Second row, positive response to A33R 20-mer and internal 14-mer peptides, and inhibition of IFN-γ accumulation upon coincubation with HLA locus-specific mAb, showing HLA DQ restriction. Third row: A representative negative response, and positive responses to two overlapping 20-mers from L1R, followed by positive response to the 11-mer representing the overlap. 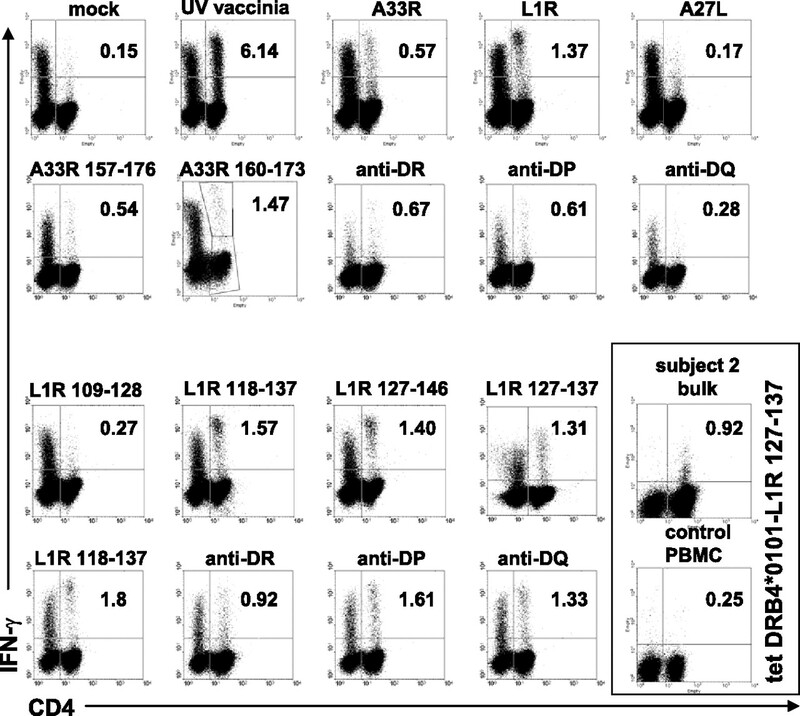 Fourth row: restriction of responses to L1R 118–137 by HLA DR. Boxed inset at right: bulk T cells from subject 2 show staining of CD4+ cells with tetramer of HLA DRA1*0101/DRB1*0401 complexed to L1R 127–137, whereas control PBMC do not. We sought to determine the HLA-restricting loci for polyclonal CD4 T cell responses. Restriction by DR, DP, and DQ loci were each frequently observed. In some cases, the subjects were homozygous at the restricting locus, allowing for assignment of the restricting locus. CTL assays with partially HLA-matched, peptide-pulsed LCLs (31, 50, 51) were also used to assist analyses of HLA restriction (Table II⇑). T cell lines from subjects 7 and 10 each reacted with the same protein fragment of ORF WR206 predicted to encode aa 11–190 for ORF WR206 (Table II⇑). The response from subject 10 was HLA-DP restricted, whereas the response from subject 7 was DR restricted. Most likely, this difference is due to recognition of separate epitopes. Similar differences in HLA-restricting loci were also noted when other protein fragments were assayed with T cell lines from separate subjects (not shown), again consistent with the presence of multiple epitopes. Some data indicate that the CD8 response may be biased to early proteins and transcription factors (26, 46, 52, 53). In contrast, only 1 of the 35 CD4 Ags (A7L) we detected is a transcription factor, and more than half are late proteins (Table III⇓). The CD4 responses emphasized membrane proteins (10 ORFs), enzymes, and core proteins. Immune evasion proteins (IFN-binding, complement regulatory, and double-stranded RNA-binding proteins) were also represented, as were proteins of unknown function. Three recent mass spectroscopy surveys of the proteome of purified vaccinia virions, typically intracellular mature virions, are generally in agreement. Overall, these studies found that 27 (77%) of the 35 CD4 Ags disclosed in this report are present in virions (54, 55, 56). A total of 63 to 80 proteins of 218 predicted vaccinia proteins (29 to 37%) were identified in virions. The association between ORF CD4 antigenicity and presence in virions is nonrandom (p < 0.0001, assuming 80 structural proteins). The largest kinetic category (17 of 31 CD4 antigenic proteins with data in the literature) were late vaccinia proteins. We elected to use the traditional vaccinia strain Copenhagen nomenclature (37), based on restriction endonuclease fragments, for antigenic vaccinia proteins. Sequence recently became available for three clones of NYCBH (GenBank DQ37795, AY313847, AY313848). Our subjects were vaccinated with Dryvax, a product related to NYCBH. We cannot judge which of the sequenced clones is closest to Dryvax. For those ORFs not predicted to be present in Copenhagen, we followed literature precedent and used strain WR nomenclature (44, 54). The three WR ORFs we report as CD4 Ags, WR148, WR149, and WR206, are each present in each of the three sequenced NYCBH clones with 95–100% sequence homology to the WR ORF (37). The CD4 response to vaccinia is important for clearance of virus and for long-term protection against heterologous orthopoxvirus challenge. Vaccinia can disrupt Ag presentation by MHC class II (57). Live or UV-inactivated vaccinia down-regulates presentation of endogenously expressed proteins, as well as presentation of exogenous soluble protein or peptide. DC, macrophages, B cells, and fibroblasts are susceptible. Our data show that a brisk, diverse CD4 response nevertheless develops after vaccination with replication-competent vaccinia. The present studies expand limited data on orthopoxvirus-specific CD4 T cell responses (19). Recently, CD4 reactivity was documented with vaccinia ORFs A27L, L1R, B5R, and A33R, which are each targets of neutralizing Abs (58). Three epitopes were identified in A27L. Vaccinia-immune H-2b mice have splenocyte proliferative (likely CD4+) responses to ORFs D8L and A27L (59). We detected responses to D8L. The HLA alleles restricting responses to A27L were not stated (58), so we cannot know if we missed A27L-specific responses in HLA-appropriate subjects. We studied persons 2–6 wk after primary vaccination. Zaunders et al. (60) tracked PBMC CD4 responses in similar subjects. Activated (CD38+) cells peaked on day 14 at 5–7% of CD4+ cells. Using whole viral Ag, CD4+ cells up-regulating CD134 in response to vaccinia reached similar levels. IFN-γ+ CD4 cells peaked at ∼1%, as observed in this study and by others (18, 61). To investigate the difference between assays, Zaunders et al. sought, but did not detect, bystander CD4 T cell activation. It is therefore possible that some vaccinia-specific CD4 cells are IFN-γ negative, and in fact IL-2, CD40L, or TNF-α+ cells that were IFN-γ− were detected. We observed clones with proliferative but not IFN-γ responses (Fig. 1⇑). This implies that the overall CD4 magnitude, Ag dominance hierarchies (Fig. 6⇑), and diversity could vary by T cell readout, an issue we can now address with specific vaccinia Ags and epitopes. Using in vitro cell lines, we were able to account for 50–80% of IFN-γ CD4 reactivity to whole killed virus. This level of completeness is unusual for T cell studies in humans or mice. In some previous studies of CD8 responses to vaccinia, the summation of peptide-specific responses actually exceeded the response to whole virus, in at least some donors (53, 62, 63). We titered the whole virus preparation, and used it at the concentration giving maximal CD4 IFN-γ responses (Fig. 6⇑). Although we believe the relative magnitudes and rank orders of the peptide/Ag region-specific responses we measured are relevant in vivo, future direct ex vivo studies will be required to confirm our findings. It is possible that our secondary in vitro re-stimulation with UV-killed vaccinia produced cell lines biased toward responses to certain proteins, if some vaccinia polypeptides were missing or under-represented in our whole virus preparation. As mentioned, mass spectroscopy studies detected 80 vaccinia gene products in purified virions. We know our preparation, made from and specifically designed to include infected cell material as well as virions, also contained nonstructural proteins. For example, enough A48R protein, a nonstructural protein (54, 55, 56), was present to both enrich A48R-specific T cells before cloning, and drive strong proliferation by an A48R-specific CD4 T cell clone (Fig. 3⇑). In addition, responses to several other nonstructural proteins (B19R, C3L, C10L, C14L, F11L, and O1L, Table III⇑) were detected in T cell lines created by PBMC stimulation with our whole virus Ag. The diversity estimates from our studies are less susceptible to artifacts from in vitro cell expansion and are likely to be minimal estimates. We stopped decoding low-positive library pools when the pool breakdown process failed to yield antigenic single bacterial colonies and omitted borderline responses from our final analyses. For example, single bacterially expressed fragments of H7R and B2R were reproducibly, weakly (Δcpm <2000 cpm) positive in proliferation assays and also low-positive in IFN-γ ICC (<0.3% of CD4 T cells above background) in all replicates. As overlapping genomic hits were not obtained for these regions, we did not assign these ORFs CD4 reactivity. Each response that we investigated in detail yielded an antigenic peptide. We have prioritized for future work determining the peptide specificity of the responses to F11L and other protein fragments that drove abundant CD4 IFN-γ responses. Combined with CD8 work from our laboratory and that of others, it is now rational to select candidate immunodominant ORFs for complete sets of overlapping peptides for examination of both CD4 and CD8 responses in wider specimen sets. Viral proteins can be classified by structural (capsid, envelope, etc. ), functional (transcription, replication, immune evasion, entry, etc. ), and kinetic (early vs late corresponding to before and after genome replication) criteria. Viral proteins usually have multiple functions, complicating simple, yet meaningful classification (Table III⇑). Poxviruses replicate in the cytoplasm and encode unusually complete DNA replication machinery, some of which is preformed in virions (64). It is notable that enzymes are well represented among CD4 Ags (Table III⇑). Extracellular enveloped virions are a special form of virions. At least three extracellular enveloped virion-specific proteins (A34R, A33R, and F13L) are CD4 Ags. 17 of the 35 Ags (54, 64) are late vaccinia protein, with 8 early, 1 early intermediate, 1 intermediate, 3 early late, and 5 without data. Protein expression kinetics are related to structure and function, with most virion components synthesized with after DNA replication (late) (64). The relationship between CD4 antigenicity and late structural gene products diverges from CD8 Ags, among which transcription factors and other early nonstructural proteins appear to be dominant (46). Immunodominance occurs when T cells reactive with specific epitopes comprise a large numerical proportion of the total number of T cells reactive with a pathogen (65). CD8 responses to the vaccinia, and large-genome herpesviruses, display moderate to extreme immunodominance in inbred mice (43, 44, 66). CD4 immunodominance is noted in the MHC class II-restricted response to LACK in Leishmania-infected H-2d mice (67). Several factors influence CD4 immunodominance, including HLA-DM, the susceptibility of epitope-flanking regions to proteolysis, trafficking of proteins to various membranous compartments, especially in the setting of intracellular Ag synthesis, and innate activation of APC (68). MHC allelic variation of course plays a role, but probably less so than for CD8 responses due to the greater promiscuity for peptide binding of MHC class II compared with MHC class I. The priming of CD4 responses in vivo is thought to occur principally after phagocytosis and processing of Ag by professional APC, rather than as a consequence of endogenous synthesis. In this setting, Ag abundance has been hypothesized to influence the magnitude of CD4 responses (68). In our data set, proteins that are present in purified virion preparations were recognized significantly more often than proteins that are not detected in virions. There was no obvious relationship, however, between immunodominance, as assessed by hierarchies of IFN-γ responder cell numbers (Fig. 6⇑) or the presence of multiple epitopes per ORF (Table II⇑) and protein occurrence in virions (55). A3L, for example, was dominant in subject 2 and contains at least 3 epitopes. In contrast, a fragment of ORF F11L showed within-subject dominance in subjects 7 and 10, but F11L has not been detected in virions. F11L is generally conserved in orthopoxviruses, but in the candidate vaccine/vector, MVA, the F11L region is split into two potential ORFs. The first is predicted to express a 96 aa long polypeptide that is 100% homologous to vaccinia Copenhagen in the antigenic region we identified (37, 69, 70). It is not known whether this truncated form is transcribed or translated. Full-length F11L (348 aa) is expressed early (71), effects cell motility via RhoA, and is required for productive infection of primate cells (69). MVA F11L expression can be addressed by testing F11L-specific clones with MVA preparations. H3L was strongly recognized by subjects 2 and 10. This protein induces neutralizing Abs (49, 72). H3L 229–237 (ILDNAAKYV) accounted for ∼7% of reactivity to whole virus (Fig. 5⇑) in subject 2. Restriction by DRB4*0101 is implied from mAb inhibition and the HLA-DR alleles expressed by these subjects. Direct binding assays and binding of HLA peptide tetramers to reactive cell lines, confirmed binding of an epitope in another neutralizing Ag, L1R to DRB4*0101. We compared CD4 Ags to those that drive human or murine HLA-transgenic CD8+ responses (26, 53, 58, 62, 73, 74, 75, 76, 77). Overall 16 ORFs (A3L, A10L, A33R, A34R, A48R, A50R, B19R, C3L, C10L, D5R, E3L, G7L, H3L, I3L, J6R, and O1L) are both CD4 and CD8 Ags. ORFs A3L and D5R contain multiple CD4 and CD8 epitopes. Within subject 2, we found 15 ORFs with only CD4 responses, 9 with only CD8 responses, and 4 (A3L, A48R, D5R, and E3L) with both (26). In the future, we hope to extend our studies to within-person comparison of Ab and CD4 responses. This issue is of practical interest for subunit vaccine design, and of basic interest with regards to theories of cognate vs nonspecific CD4-B cell help (78). Diverse methods are used to investigate T cell responses to complex pathogens (46). Complete sets of synthetic peptides can detect both CD4 and CD8 T cell responses (79). A related approach uses peptides that are predicted to tightly bind relevant MHC molecules. A distinct minority of peptides is hits, but clear epitope hierarchies can be observed. The majority of the total virus-specific response can be accounted for in inbred mice (43). The method we use probes vaccinia-specific T cell clones or lines that have responded once to vaccinia in vitro before we probe them. This may add specificity, as T cells can react to many peptide-MHC combinations (80). Enrichment could distort the hierarchy of responses, due to differential re-stimulation or expansion. We use a crude mixture of sonicated infected cell debris as Ag, rather than purified virions or supernatant, to include all viral proteins. Future work will examine dominance hierarchies among unmanipulated responder cells. For this study, we modified previous HSV-2 CD4 technology (31) to improve throughput. Polyclonal CD4 cell lines gave an adequate signal-to-noise ratio, sparing resources from making T cell clones. We used random viral DNA fragments, derivatized with adaptors, to make one library, rather than using libraries generated in each fusion reading frame. Random fragmentation, in place of restriction enzymes, reduced the chance of bisecting epitopes. Ag preparation was fast and simple by heat-killing E. coli containing inclusion bodies of recombinant proteins. APC present in PBMC process dead bacteria. It is possible some vaccinia proteins were poorly expressed in our E. coli library. Gao et al. (81) used a different fusion partner and Coomassie blue staining, an insensitive method, and found 16% of 50 full-length vaccinia ORFs were not expressed. One of their nonexpressed ORFs, E4L, was definitely expressed by our library (Tables II⇑ and III⇑). Our system expresses fragments rather than full-length vaccinia ORFs. These are less likely to be toxic in E. coli due to enzymatic activity, and our oversampling of the proteome gives each epitope several independent opportunities for expression. In addition, we fuse vaccinia fragments with a form of β-galactosidase known to be highly expressed in E. coli. T cells are sensitive to low levels of protein (82), but likely no library can be truly complete. Our work was also assisted by fortuitous translation initiation at internal methionine codons within plasmids. We observed many examples in which fragments of vaccinia genes fused out of frame to lacZ were still antigenic as proven with synthetic peptides or PCR-amplified genes expressed in-frame with β-galactosidase. A related occurrence is initiation, in E. coli, at vaccinia AUG start codons. For example, an antigenic E. coli colony contained lacZ sequences in fusion with 162 backward bp from the N-terminal region of gene D9R (83). This is predicted to encode 8 aa followed by a stop codon. The insert continues with intergenic DNA and the initial ATG and the next 176 aa of D8L. D8L fragment 1–177 was expressed and found to be antigenic. The CD4 antigenic regions identified in this report should be useful in comparing the CD4 responses of different products currently under evaluation for smallpox prevention. Most, such as MVA and NYVAC, are not replication competent in human cells, potentially altering the quantity and/or quality of specific immunity. Many of the Ags and epitopes eliciting CD4 responses are preserved in these alternative vaccines. Defined epitopes may also be useful in comparing poxvirus vectors being studied as backbones to express heterologous Ags, in which a strong anti-insert response is desired and an immunodominating anti-vector response is disadvantageous. Myocarditis is a rare complication of vaccinia vaccination with infiltrating leukocytes and no virus in affected hearts (84, 85), consistent with a possible autoimmune component. We detected allo-cross-reactivity (Fig. 3⇑), in which a CD4+ T cell clone recognizes self-HLA plus vaccinia peptide, and also allogeneic cells. This demonstrates that vaccinia-specific T cells can show promiscuous APC recognition, typical of many virus-specific T cells (86, 87). Self-reactive T cells are not entirely eliminated during development (88), and it is possible that CD4 T cells reactive with vaccinia epitopes could also cross-react with self-HLA and peptides derived from cellular proteins. In summary, live, replication-competent orthopoxvirus infection stimulates a broad CD4 response in humans. Several vaccinia ORFs contain multiple discrete epitopes, and some ORFs elicit both CD4 and CD8 responses in the same subject. The CD4 response appears to emphasize late, structural virion proteins, and proteins with enzymatic activity. Future work will determine how these CD4 responses contribute to the extraordinarily durable and complete functional protection afforded by vaccination with vaccinia. Improved understanding of these factors may allow the harnessing of these natural events for the design of poxvirus-based vaccines for the prevention or therapy of infectious or malignant disorders, an ongoing research in many laboratories. Dr. Elaine Jong assisted with recruitment. Koelle and Jing are co-inventors on a preliminary patent concerning use of vaccinia proteins as vaccines, filed by their employer, Univ. of Washington. No final application has been filed and no royalty payments or licensing activity has occurred. ↵1 This work was supported by National Institutes of Health Grants AI061636 and AI067496 (to D.M.K. ), AI062486 and AI057168 (to G.H.C. and R.J.E. ), and AI56268 and HHSN266200400124C (to A.S.). ↵3 Abbreviations used in this paper: MVA, modified vaccinia Ankara; ICC, intracellular cytokine cytometry; WR, Western Reserve; TCM, T cell medium; ORF, open reading frame. Castellino, F., R. N. Germain. 2006. Cooperation between CD4+ and CD8+ T cells: when, where, and how. Annu. Rev. Immunol. 24: 519-540. Ashton-Rickardt, P. G.. 2004. A license to remember. Nat. Immunol. 5: 1097-1098. Bevan, M. J.. 2004. Helping the CD8+ T-cell response. Nat. Rev. Immunol. 4: 595-602. DiPerna, G., J. Stack, A. G. Bowie, A. Boyd, G. Kotwal, Z. Zhang, S. Arvikar, E. Latz, K. A. Fitzgerald, W. L. Marshall. 2004. Poxvirus protein N1L targets the I-κB kinase complex, inhibits signaling to NF-κB by the tumor necrosis factor superfamily of receptors, and inhibits NF-κB and IRF3 signaling by toll-like receptors. J. Biol. Chem. 279: 36570-36578. Harte, M. T., I. R. Haga, G. Maloney, P. Gray, P. C. Reading, N. W. Bartlett, G. L. Smith, A. Bowie, L. A. O’Neill. 2003. The poxvirus protein A52R targets Toll-like receptor signaling complexes to suppress host defense. J. Exp. Med. 197: 343-351. Stack, J., I. R. Haga, M. Schroder, N. W. Bartlett, G. Maloney, P. C. Reading, K. A. Fitzgerald, G. L. Smith, A. G. Bowie. 2005. Vaccinia virus protein A46R targets multiple Toll-like-interleukin-1 receptor adaptors and contributes to virulence. J. Exp. Med. 201: 1007-1018. Xu, R., A. J. Johnson, D. Liggitt, M. J. Bevan. 2004. Cellular and humoral immunity against vaccinia virus infection of mice. J. Immunol. 172: 6265-6271. Wyatt, L. S., P. L. Earl, L. A. Eller, B. Moss. 2004. Highly attenuated smallpox vaccine protects mice with and without immune deficiencies against pathogenic vaccinia virus challenge. Proc. Natl. Acad. Sci. USA 101: 4590-4595. Bachmann, M. F., K. Schwarz, P. Wolint, E. Meijerink, S. Martin, V. Manolova, A. Oxenius. 2004. Cutting edge: distinct roles for T help and CD40/CD40 ligand in regulating differentiation of proliferation-competent memory CD8+ T cells. J. Immunol. 173: 2217-2221. Bachmann, M. F., P. Wolint, K. Schwarz, A. Oxenius. 2005. Recall proliferation potential of memory CD8+ T cells and antiviral protection. J. Immunol. 175: 4677-4685. Buller, R. M., K. L. Holmes, A. Hugin, T. N. Frederickson, H. C. Morse, 3rd. 1987. Induction of cytotoxic T-cell responses in vivo in the absence of CD4 helper cells. Nature 328: 77-79. Karupiah, G., R. M. Buller, N. Van Rooijen, C. J. Duarte, J. Chen. 1996. Different roles for CD4+ and CD8+ T lymphocytes and macrophage subsets in the control of a generalized virus infection. J. Virol. 70: 8301-8309. Edghill-Smith, Y., H. Golding, J. Manischewitz, L. R. King, D. Scott, M. Bray, A. Nalca, J. W. Hooper, C. A. Whitehouse, J. E. Schmitz, et al 2005. Smallpox vaccine-induced antibodies are necessary and sufficient for protection against monkeypox virus. Nat. Med. 11: 740-747. Belyakov, I. M., P. Earl, A. Dzutsev, V. A. Kuznetsov, M. Lemon, L. S. Wyatt, J. T. Snyder, J. D. Ahlers, G. Franchini, B. Moss, J. A. Berzofsky. 2003. Shared modes of protection against poxvirus infection by attenuated and conventional smallpox vaccine viruses. Proc. Natl. Acad. Sci. USA 100: 9458-9463. Garside, P., E. Ingulli, R. R. Merica, J. G. Johnson, R. J. Noelle, M. K. Jenkins. 1998. Visualization of specific B and T lymphocyte interactions in the lymph node. Science 281: 96-99. Hammarlund, E., M. W. Lewis, S. G. Hansen, L. I. Strelow, J. A. Nelson, G. J. Sexton, J. M. Hanifin, M. K. Slifka. 2003. Duration of antiviral immunity after smallpox vaccination. Nat. Med. 9: 1131-1137. Demkowicz, W. E., Jr, R. A. Littaua, J. Wang, F. A. Ennis. 1996. Human cytotoxic T-cell memory: long-lived responses to vaccinia virus. J. Virol. 70: 2627-2631. Littaua, R. A., A. Takeda, J. Cruz, F. A. Ennis. 1992. Vaccinia virus-specific human CD4+ cytotoxic T-lymphocyte clones. J. Virol. 66: 2274-2280. Combadiere, B., A. Boissonnas, G. Carcelain, E. Lefranc, A. Samri, F. Bricaire, P. Debre, B. Autran. 2004. Distinct time effects of vaccination on long-term proliferative and IFN-γ-producing T cell memory to smallpox in humans. J. Exp. Med. 199: 1585-1593. Slifka, M. K.. 2004. Immunological memory to viral infection. Curr. Opin. Immunol. 16: 443-450. Crotty, S., P. Felgner, H. Davies, J. Glidewell, L. Villarreal, R. Ahmed. 2003. Cutting edge: long-term B cell memory in humans after smallpox vaccination. J. Immunol. 171: 4969-4973. Amara, R. R., P. Nigam, S. Sharma, J. Liu, V. Bostik. 2004. Long-lived poxvirus immunity, robust CD4 help, and better persistence of CD4 than CD8 T cells. J. Virol. 78: 3811-3816. Redfield, R. R., D. C. Wright, W. D. James, T. S. Jones, C. Brown, D. S. Burke. 1987. Disseminated vaccinia in a military recruit with human immunodeficiency virus (HIV) disease. N. Engl. J. Med. 316: 673-676. Jing, L., T. M. Chong, C. L. McClurkan, J. Huang, B. T. Story, D. M. Koelle. 2005. Diversity in the acute CD8 T cell response to vaccinia virus in humans. J. Immunol. 175: 7550-7559. Koelle, D. M., L. Corey, R. L. Burke, R. J. Eisenberg, G. H. Cohen, R. Pichyangkura, S. J. Triezenberg. 1994. Antigenic specificity of human CD4+ T cell clones recovered from recurrent genital HSV-2 lesions. J. Virol. 68: 2803-2810. Koelle, D. M., H. Chen, M. A. Gavin, A. Wald, W. W. Kwok, L. Corey. 2001. CD8 CTL from genital herpes simplex lesions: recognition of viral tegument and immediate early proteins and lysis of infected cutaneous cells. J. Immunol. 166: 4049-4058. Chen, W. F., A. Wilson, R. Scollay, K. Shortman. 1982. Limit-dilution assay and clonal expansion of all T cells capable of proliferation. J. Immunol. Methods 52: 307-322. Tigges, M. A., D. M. Koelle, K. Hartog, R. E. Sekulovich, L. Corey, R. L. Burke. 1992. Human CD8+ herpes simplex virus-specific cytotoxic T lymphocyte clones recognize diverse virion protein antigens. J. Virol. 66: 1622-1634. Koelle, D. M., J. M. Frank, M. L. Johnson, W. W. Kwok. 1998. Recognition of herpes simplex virus type 2 tegument proteins by CD4 T cells infiltrating human genital herpes lesions. J. Virol. 72: 7476-7483. Koelle, D. M., J. Huang, M. T. Hensel, C. L. McClurkan. 2006. Innate immune responses to herpes simplex virus type 2 influence skin homing molecule expression by memory CD4+ lymphocytes. J. Virol. 80: 2863-2872. Gonzalez, J. C., W. W. Kwok, A. Wald, C. L. McClurkan, D. M. Koelle. 2005. Programmed expression of cutaneous lymphocyte-associated antigen amongst circulating memory T-cells specific for HSV-2. J. Infect. Dis. 191: 243-254. Posavad, C. M., A. Wald, N. Hosken, M.-L. Huang, D. M. Koelle, L. Corey. 2003. T cell immunity to herpes simplex virus in seronegative persons: silent infection or acquired immunity. J. Immunol. 170: 4380-4388. Reijonen, H., W. W. Kwok. 2003. Use of HLA class II tetramers in tracking antigen-specific T cells and mapping T-cell epitopes. Methods 29: 282-288. Lefkowitz, E. J., C. Upton, S. S. Changayil, C. Buck, P. Traktman, R. M. Buller. 2005. Poxvirus Bioinformatics Resource Center: a comprehensive Poxviridae informational and analytical resource. Nucleic Acids Res. 33: (Database Issue):D311-D316. Aldaz-Carroll, L., J. C. Whitbeck, M. P. de Leon, H. Lou, L. K. Pannell, J. Lebowitz, C. Fogg, C. L. White, B. Moss, G. H. Cohen, R. J. Eisenberg. 2005. Physical and immunological characterization of a recombinant secreted form of the membrane protein encoded by the vaccinia virus L1R gene. Virology 341: 59-71. Aldaz-Carroll, L., J. C. Whitbeck, M. Ponce de Leon, H. Lou, L. Hirao, S. N. Isaacs, B. Moss, R. J. Eisenberg, G. H. Cohen. 2005. Epitope-mapping studies define two major neutralization sites on the vaccinia virus extracellular enveloped virus glycoprotein B5R. J. Virol. 79: 6260-6271. Marsh, S. G. E., P. Parham, L. D. Barber. 2000. The HLA FactsBook Academic Press, San Diego. Koelle, D. M., M. Schomogyi, C. McClurkan, S. N. Reymond, H. B. Chen. 2000. CD4 T-cell responses to herpes simplex virus type 2 major capsid protein VP5: comparison with responses to tegument and envelope glycoproteins. J. Virol. 74: 11422-11425. Dolan, A., F. E. Jamieson, C. Cunningham, B. C. Barnett, D. J. McGeoch. 1998. The genome sequence of herpes simplex virus type 2. J. Virol. 72: 2010-2021. Moutaftsi, M., B. Peters, V. Pasquetto, D. C. Tscharke, J. Sidney, H. H. Bui, H. Grey, A. Sette. 2006. A consensus epitope prediction approach identifies the breadth of murine T(CD8+)-cell responses to vaccinia virus. Nat. Biotechnol. 24: 817-819. Tscharke, D. C., W. P. Woo, I. G. Sakala, J. Sidney, A. Sette, D. J. Moss, J. R. Bennink, G. Karupiah, J. W. Yewdell. 2006. Poxvirus CD8+ T-cell determinants and cross-reactivity in BALB/c mice. J. Virol. 80: 6318-6323. Wallace, M. E., R. Keating, W. R. Heath, F. R. Carbone. 1999. The cytotoxic T-cell response to herpes simplex virus type 1 infection of C57BL/6 mice is almost entirely directed against a single immunodominant determinant. J. Virol. 73: 7619-7626. Yewdell, J. W.. 2006. Confronting complexity: real-world immunodominance in antiviral CD8+ T cell responses. Immunity 25: 533-543. Fogg, C., S. Lustig, J. C. Whitbeck, R. J. Eisenberg, G. H. Cohen, B. Moss. 2004. Protective immunity to vaccinia virus induced by vaccination with multiple recombinant outer membrane proteins of intracellular and extracellular virions. J. Virol. 78: 10230-10237. Lustig, S., C. Fogg, J. C. Whitbeck, R. J. Eisenberg, G. H. Cohen, B. Moss. 2005. Combinations of polyclonal or monoclonal antibodies to proteins of the outer membranes of the two infectious forms of vaccinia virus protect mice against a lethal respiratory challenge. J. Virol. 79: 13454-13462. Davies, D. H., M. M. McCausland, C. Valdez, D. Huynh, J. E. Hernandez, Y. Mu, S. Hirst, L. Villarreal, P. L. Felgner, S. Crotty. 2005. Vaccinia virus H3L envelope protein is a major target of neutralizing antibodies in humans and elicits protection against lethal challenge in mice. J. Virol. 79: 11724-11733. Koelle, D. M., M. L. Johnson, A. N. Ekstrom, P. Byers, W. W. Kwok. 1997. Preferential presentation of herpes simplex virus T-cell antigen by HLA DQA1*0501/DQB1*0201 in comparison to HLA DQA1*0201/DQB1*0201. Hum. Immunol. 53: 195-205. Koelle, D. M., S. N. Reymond, H. Chen, W. W. Kwok, C. McClurkan, T. Gyaltsong, E. W. Petersdorf, W. Rotkis, A. R. Talley, D. A. Harrison. 2000. Tegument-specific, virus-reactive CD4 T-cells localize to the cornea in herpes simplex virus interstitial keratitis in humans. J. Virol. 74: 10930-10938. Tscharke, D. C., G. Karupiah, J. Zhou, T. Palmore, K. R. Irvine, S. M. Haeryfar, S. Williams, J. Sidney, A. Sette, J. R. Bennink, J. W. Yewdell. 2005. Identification of poxvirus CD8+ T cell determinants to enable rational design and characterization of smallpox vaccines. J. Exp. Med. 201: 95-104. Oseroff, C., F. Kos, H.-H. Bui, B. Peters, V. Pasquetto, J. Glenn, T. Palmore, J. Sidney, D. C. Tscharke, J. R. Bennink, et al 2005. HLA class I restricted responses to vaccinia recognize a broad array of proteins mainly involved in virulence and viral gene regulation. Proc. Natl. Acad. Sci. USA 102: 13980-13985. Resch, W., K. K. Hixson, R. J. Moore, M. S. Lipton, B. Moss. 2006. Protein composition of the vaccinia virus mature virion. Virology 358: 233-247. Chung, C. S., C. H. Chen, M. Y. Ho, C. Y. Huang, C. L. Liao, W. Chang. 2006. Vaccinia virus proteome: identification of proteins in vaccinia virus intracellular mature virion particles. J. Virol. 80: 2127-2140. Townsend, A., J. Bastin, K. Gould, G. Brownlee, M. Andrew, B. Coupar, D. Boyle, S. Chan, G. Smith. 1988. Defective presentation to class I-restricted cytotoxic T lymphocytes in vaccinia-infected cells is overcome by enhanced degradation of antigen. J. Exp. Med. 168: 1211-1224. Tang, J., M. Murtadha, M. Schnell, L. C. Eisenlohr, J. Hooper, P. Flomenberg. 2006. Human T-cell responses to vaccinia virus envelope proteins. J. Virol. 80: 10010-10020. Demkowicz, W. E., J. S. Maa, M. Esteban. 1992. Identification and characterization of vaccinia virus genes encoding proteins that are highly antigenic in animals and are immunodominant in vaccinated humans. J. Virol. 66: 386-398. Zaunders, J. J., W. B. Dyer, M. L. Munier, S. Ip, J. Liu, E. Amyes, W. Rawlinson, R. De Rose, S. J. Kent, J. S. Sullivan, et al 2006. CD127+CCR5+CD383+CD4+ Th1 effector cells are an early component of the primary immune response to vaccinia virus and precede development of interleukin-2+ memory CD4+ T cells. J. Virol. 80: 10151-10161. Kennedy, J. S., S. E. Frey, L. Yan, A. L. Rothman, J. Cruz, F. K. Newman, L. Orphin, R. B. Belshe, F. A. Ennis. 2004. Induction of human T cell-mediated immune responses after primary and secondary smallpox vaccination. J. Infect. Dis. 190: 1286-1294. Terajima, M., J. Cruz, A. M. Leporati, W. E. Demkowicz, Jr, J. S. Kennedy, F. A. Ennis. 2006. Identification of vaccinia CD8+ T-cell epitopes conserved among vaccinia and variola viruses restricted by common MHC class I molecules, HLA-A2 or HLA-B7. Hum. Immunol. 67: 512-520. Smith, C. L., F. Mirza, V. Pasquetto, D. C. Tscharke, M. J. Palmowski, P. R. Dunbar, A. Sette, A. L. Harris, V. Cerundolo. 2005. Immunodominance of poxviral-specific CTL in a human trial of recombinant-modified vaccinia Ankara. J. Immunol. 175: 8431-8437. Moss, B.. 2001. Poxviridae: the viruses and their replication. D. M. Knipe, Jr, and P. M. Howley, Jr, eds. In Fields Virology Vol. 2: 2849-2883. Lippincott Williams and Wilkins, Philadelphia. Sercarz, E. E., P. V. Lehmann, A. Ametani, G. Benichou, A. Miller, K. Moudgil. 1993. Dominance and crypticity of T cell antigenic determinants. Annu. Rev. Immunol. 11: 729-766. Cose, S. C., J. M. Kelly, F. R. Carbone. 1995. Characterization of a diverse primary herpes siplex virus type 1 gB-specific cytotoxic T-cell response showing a preferential V β bias. J. Virol. 69: 5849-5852. Nanda, N. K., E. K. Bikoff. 2005. DM peptide-editing function leads to immunodominance in CD4 T cell responses in vivo. J. Immunol. 175: 6473-6480. Sant, A. J., F. A. Chaves, S. A. Jenks, K. A. Richards, P. Menges, J. M. Weaver, C. A. Lazarski. 2005. The relationship between immunodominance, DM editing, and the kinetic stability of MHC class II:peptide complexes. Immunol. Rev. 207: 261-278. Valderrama, F., J. V. Cordeiro, S. Schleich, F. Frischknecht, M. Way. 2006. Vaccinia virus-induced cell motility requires F11L-mediated inhibition of RhoA signaling. Science 311: 377-381. Antoine, G., F. Scheiflinger, F. Dorner, F. G. Falkner. 1998. The complete genomic sequence of the modified vaccinia Ankara strain: comparison with other orthopoxviruses. Virology 244: 365-396. Kato, S. E., F. A. Greco, C. R. Damaso, R. C. Condit, N. Moussatche. 2004. An alternative genetic method to test essential vaccinia virus early genes. J. Virol. Methods 115: 31-40. Davies, D. H., X. Liang, J. E. Hernandez, A. Randall, S. Hirst, Y. Mu, K. M. Romero, T. T. Nguyen, M. Kalantari-Dehaghi, S. Crotty, et al 2005. Profiling the humoral immune response to infection by using proteome microarrays: high-throughput vaccine and diagnostic antigen discovery. Proc. Natl. Acad. Sci. USA 102: 547-552. Pasquetto, V., H.-H. Bui, R. Giannino, F. Mirza, J. Sidney, C. Oseroff, D. C. Tscharke, K. Irvine, J. R. Bennink, B. Peters, et al 2005. Immunomic-based discovery of CTL determinants in complex HLA A*0201-A*1101 and B*0702 transgenic mice recognize numerous poxvirus determinants from a wide variety of gene products. J. Immunol. 175: 5504-5515. Terajima, M., J. Cruz, G. Raines, E. D. Kilpatrick, J. S. Kennedy, A. L. Rothman, F. A. Ennis. 2003. Quantitation of CD8+ T cell responses to newly identified HLA-A*0201-restricted T cell epitopes conserved among vaccinia and variola (smallpox) viruses. J. Exp. Med. 197: 927-932. Snyder, J. T., I. M. Belyakov, A. Dzutsev, F. Lemonnier, J. A. Berzofsky. 2004. Protection against lethal vaccinia virus challenge in HLA-A2 transgenic mice by immunization with a single CD8+ T-cell peptide epitope of vaccinia and variola viruses. J. Virol. 78: 7052-7060. Drexler, I., C. Staib, W. Kastenmuller, S. Stevanovic, B. Schmidt, F. A. Lemmonier, H. G. Rammansee, D. H. Busch, H. Berhnard, V. Erfle, G. Sutter. 2003. Identification of vaccinia virus epitope-specific HLA-A*0201-restricted T cells and comparative analysis of smallpox vaccines. Proc. Natl. Acad. Sci. USA 100: 217-222. Dong, Y., T. N. Denny. 2006. HLA-A2-restricted human CD8+ cytotoxic T lymphocyte responses to a novel epitope in vaccinia virus that is conserved among orthopox viruses. J. Infect. Dis. 169: 168-175. Hebeis, B. J., K. Klenovsek, P. Rohwer, U. Ritter, A. Schneider, M. Mach, T. H. Winkler. 2004. Activation of virus-specific memory B cells in the absence of T cell help. J. Exp. Med. 199: 593-602. Sylwester, A. W., B. L. Mitchell, J. B. Edgar, C. Taormina, C. Pelte, F. Ruchti, P. R. Sleath, K. H. Grabstein, N. A. Hosken, F. Kern, et al 2005. Broadly targeted human cytomegalovirus-specific CD4+ and CD8+ T cells dominate the memory compartments of exposed subjects. J. Exp. Med. 202: 673-685. Gao, M., N. Brufatto, T. Chen, L. L. Murley, R. Thalakada, M. Domagala, B. Beattie, D. Mamelak, V. Athanasopoulos, D. Johnson, et al 2005. Expression profiling of herpesvirus and vaccinia virus proteins using a high-throughput baculovirus screening system. J. Proteome Res. 4: 2225-2235. Goebel, S. J., G. P. Johnson, M. E. Perkus, S. W. Davis, J. P. Winslow, E. Paoletti. 1990. The complete DNA sequence of vaccinia virus. Virology 179: 247-266. 517–563. Halsell, J. S., J. R. Riddle, J. E. Atwood, P. Gardner, R. Shope, G. A. Poland, G. C. Gray, S. Ostroff, R. E. Eckart, D. R. Hospenthal, et al 2003. Myopericarditis following smallpox vaccination among vaccinia-naive US military personnel. J. Am. Med. Assoc. 289: 3283-3289. Arness, M. K., R. E. Eckart, S. S. Love, J. E. Atwood, T. S. Wells, R. J. Engler, L. C. Collins, S. L. Ludwig, J. R. Riddle, J. D. Grabenstein, D. N. Tornberg. 2004. Myopericarditis following smallpox vaccination. Am. J. Epidemiol. 160: 642-651. Gjertsen, H. A., K. E. Lundin, T. Hansen, E. Thorsby. 1993. T cells specific for viral antigens presented by HLA-Dw4 recognize DR13 on allogeneic cells: a possible mechanism for induction of rejection. Transplant Immunol. 1: 126-131. Welsh, R. M., S. K. Kim, M. Cornberg, S. C. Clute, L. K. Selin, Y. N. Naumov. 2006. The privacy of T cell memory to viruses. Curr. Top. Microbiol. Immunol. 311: 117-153. Danke, N. A., D. M. Koelle, C. Yee, S. Beheray, W. W. Kwok. 2004. Autoreactive T cells in healthy individuals. J. Immunol. 172: 5967-5972. Tartaglia, J., M. E. Perkus, J. Taylor, E. K. Norton, J. C. Audonnet, W. I. Cox, S. W. Davis, J. van der Hoeven, B. Meignier, M. Riviere, et al 1992. NYVAC: a highly attenuated strain of vaccinia virus. Virology 188: 217-232.